The Los Angeles Dodgers, with their exorbitant, all-star filled payroll, were dead in the water. Manager, Don Mattingly, was feeling the heat, and his job seemed to be in imminent danger as he guided the team with a $239 million payroll to an unimpressive 10-19 start. Residing in the cellar of their division, the Dodgers were quickly becoming the most disappointing team of the year, until June 3rd. Enter Yasiel Puig, the five-tool, Cuban sensation that quickly took the league by storm, and had many fighting over whether he deserved to be an all-star after a limited time in the big leagues. Since his arrival, the Dodgers have become one of the best teams in baseball, posting a record of 60-31, while taking a commanding lead for the division title. Puig’s arrival is clearly the spark that lit the fuse for the Dodgers. It is not just his virtually unrivaled natural ability that makes Puig such a difference-maker. It’s the way that he plays the game, with a reckless abandon that is usually reserved for hard-hitting safeties in the NFL, that makes him so special. He brings an energy to the game that simply doesn’t exist in most cases. And though the rest of Major League Baseball may envy the Dodgers, the fact of the matter is that he is great for a game that has a difficult time appealing to a generation that has grown up in an extremely short attention span world. Baseball has been a game of nuance since the beginning of time. Unfortunately, young sports fans favor action and ESPN highlight-reel plays over nuance. They love the NBA Slam Dunk Contest, but pay little to no attention to the 3-point shooting contest that occurs during the same weekend. They love to watch bone-crushing NFL hits and highlight-reel touchdown catches, but ignore the work that goes on in the trenches to make those plays possible. Yasiel Puig has become Major League Baseball’s version of the slam dunk, the bone-crushing hit and the spectacular touchdown catch. And though he makes some questionable rookie mistakes, it doesn’t matter because he is leaving it all on the field every play of every game. He uses his speed on the base paths to force teams to make a perfect throw to get him out. Ironically, it would take Puig’s cannon-like arm to stop him from routinely stretching plays like a man amongst boys. His brashness may rub some Major Leaguers the wrong way, but Puig is unfazed by anything that comes his way, including a 92-mph fastball to the face that would have sidelined virtually anyone else. Not only did Puig stay in the game, he was active in the bench-clearing brawl that ensued later on. 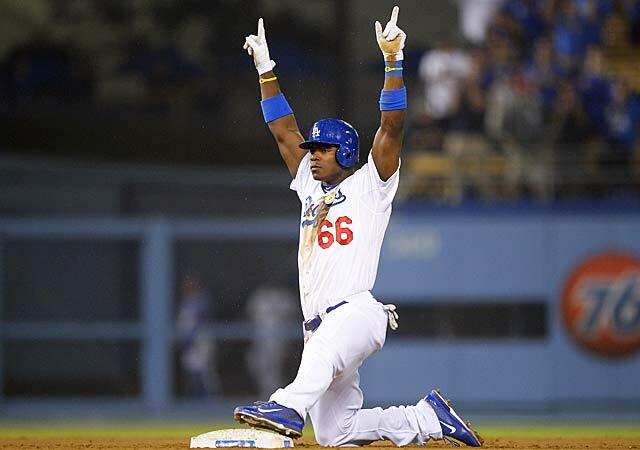 Puig made headlines recently for sliding into home plate after a walk-off, game-winning homerun. Unconventional? Absolutely! Influential? Without a doubt! It didn’t take long for a 12-year old to imitate Puig in this year’s Little League World Series, sliding into home plate after his own exciting walk-off homerun. The spark that lit the fuse is already having an impact that goes well beyond the Dodgers historic success since his arrival. Puig is making baseball exciting for a new generation of fans, and for that, we should all be grateful!